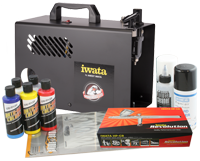 The Iwata Revolution airbrushes have the best performance and quality in their price range. They excel in all areas - the way they look, the way they handle, and especially the way they spray. All parts are made to Iwata exacting standards of quality. The spray quality is superb for an airbrush of this price range and category, and one nozzle size does it all. An easily replaced PTFE solvent-proof needle packing, highly resistant to solvent based paints, ensures these airbrushes are totally suitable for those using solvent based automotive paints or hobby enamels. 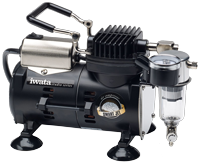 Click here for more information on Iwata airbrushes. Although the Iwata Revolution Series are the entry-level of the Iwata range, they offer better durability, reliability, performance and control than top-of-the-range airbrushes in many other brands. 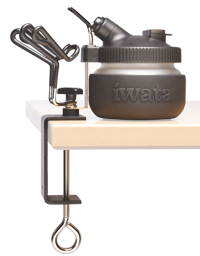 Iwata Revolution airbrushes are the perfect balance between high quality and a tighter budget. The Revolution SAR is a single action airbrush. 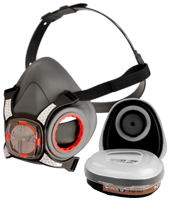 It is easy to use - one press of the trigger for air and product. The fluid adjustment knob allows you to preset the amount of product to allow through. It is useful for coverage of larger areas with one setting.